It was discovered by Captain Cook in 1777 on Christmas Eve - hence its name. They observed an eclipse of the sun from this atoll. It was also a useful resupply point. He wrote such an accurate account of the fine landing bay that many whalers and other ships would seek it out for safe refuge over the next years. Having said that, some of these ships did founder on the shifting sands of the atoll. Not a few sailors and passengers had to spend a period of enforced isolation on the island waiting for a ship on the horizon. The Americans claimed it for themselves in 1857 with a view to using the guano deposits which they did for the next few years. The British were not happy with this claim and granted licences of their own to British and Australian companies. Finally in 1888 the British annexed it outright despite protests from the Americans. 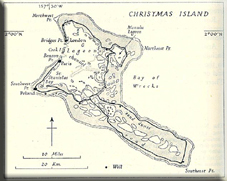 The British leased the island to Lever's Pacific Plantations Limited in June 1902 for 99 years. The Phosphate Company planted 72,863 coconut palms on 1,457 acres and introduced "silver lip" pearl shells into the lagoon. Father Emmanuel Rougier took over the lease from Lever Brothers on December 17, 1913 and then the Central Pacific Coconut Plantations, Ltd. acquired the island from him. They harvested Copra from the approximately 750,000 coconut palms that were growing there. The shalllow atoll would prove very useful in th 1930s as seaplanes began hopping long distances. The British set up a Radio station and a transit base on the island in 1937. This would play an important role in World War Two. The island is perhaps best known for its Atomic bomb tests. 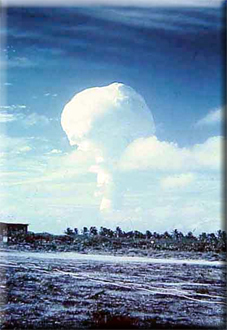 From 1957 to 1964 a series of Atomic tests near and on the islands were conducted by the British and later by the Americans in testing their H-bombs. The islands joined with Kiribati on independence in 1979. The island became Kiritimati. 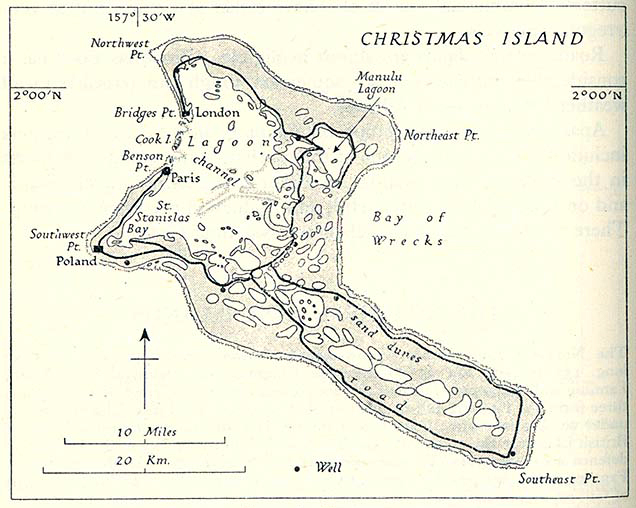 Do not confuse this island with the Indian Ocean Christmas Island.